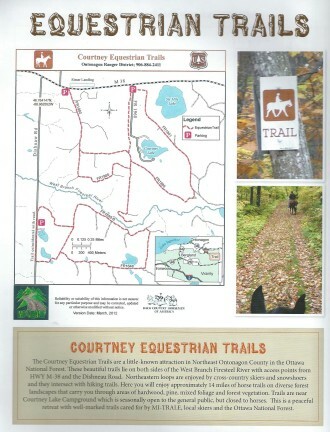 Courtney Equestrian Trails are a little known attraction in northeast Ontonagon County on the Ottawa National Forest off M38. These beautiful trails lie on both sides of the West Branch Firesteel River with access points from HWY M-38 and the Dishinaw Road. Northeastern loops are enjoyed by cross country skiers, snowshoers and intersect with hiking trails. 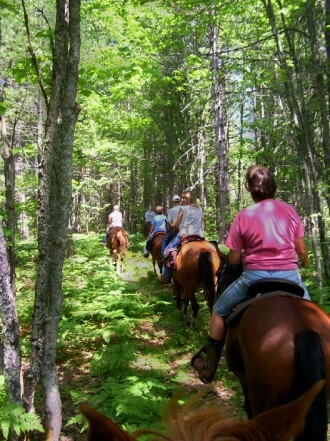 Here you will enjoy approximately 14 miles of horse trails on diverse forest landscapes that carry you through areas of hardwood, pine, mixed foliage and forest vegetation. Trails are near Courtney Lake Campground which is seasonally open to the general public, but closed to horses. Horsemen can pack and camp the backwoods at will. This is a peaceful retreat with well-marked trails, cared for by MI-TRALE, local skiers and the Ottawa National Forest. This Guide includes, ORV/ATV, Horse, Bike, Hike, River/Water trails along with lodging, food, gas, supplies, services, new trails, points of interests and a trip planner with destination loops and much more. MI-TRALE partnered with the Ottawa National Forest so we added all their trails along with our 520+ miles giving you over 2800 miles of different trails for many different types of users. Routes are open to other uses including motor vehicles, ATV’s, ORV’s, motorcycles, hikers and mountain bikes so be prepared and stay alert! Afternoon on the Trails shared with friends"